Most women experience some itchy skin every once in a while, but sometimes, the itch just won't go away. When that happens, the constant itching and scratching can range from annoying to frustrating to even downright painful. 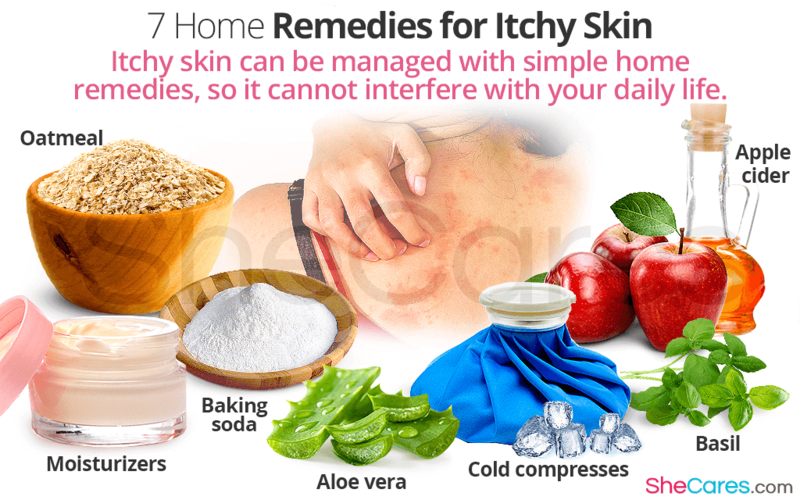 To learn how to keep a constant itch from ruining your day - read about these seven home remedies for itchy skin. Cold compresses can help the skin by reducing inflammation and calming whatever is causing the itching. An ice pack or bag of ice may be useful, but even just a cold, damp cloth can be applied to the itchy area for this purpose. Sometimes, itchy skin just happens because the skin is too dry. If this is the case, regular application of a moisturizer is likely to solve the problem. The best type of moisturizer to use as a dry, itchy skin remedy is one that is fragrance-free, since any added chemicals that create a scent may also irritate your skin and cause itching. Although normal vinegar is bad for the skin, apple cider vinegar is a valuable home remedy for just about any kind of skin problem. It is antimicrobial as well as anti-itch. It can be applied directly to the itchy area using a cotton ball or small cloth. Usually, people think of basil as mostly a culinary ingredient, but basil leaves contain two compounds called camphor and thymol that can help to stop itching. The fastest and easiest way to use basil leaves is to crush them up and rub the small pieces directly onto the itchy skin. Aloe is well-known as a sunburn remedy, but it can also be used for a number of skin ailments unrelated to the sun. It reduces swelling and irritation, which can help to relieve itching as well. You can use fresh aloe - just split the leaves open and spread the gel found inside on the skin - or you can apply a product containing aloe vera. An oatmeal bath is a familiar idea to those who suffered through chicken pox as a child. Compounds in oatmeal reduce skin inflammation, so it has been used as a skin remedy for many years. An oatmeal bath is always an option, but you can also make an oatmeal poultice for a more targeted remedy. For a quick stop to itching, using calamine - or a similar cooling product like menthol - can help. Calamine provides a cooling sensation to the nerves in the skin, which helps to reduce the itching sensation. If you suffer from especially severe itchy skin, learn all about its causes and treatments.